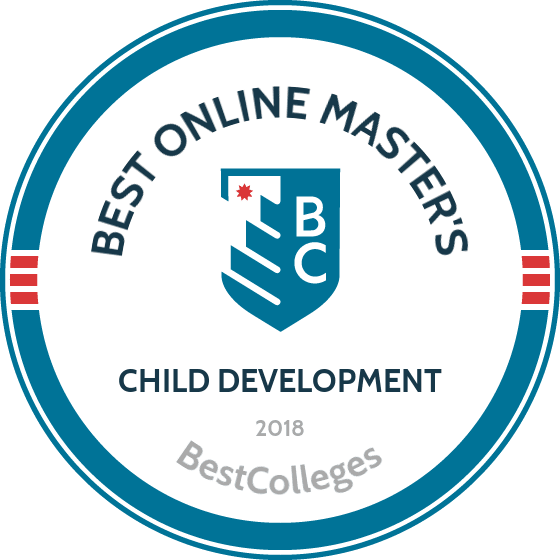 What Are The Best Online Master's in Child Development Programs? What Else Can I Expect From an Online Master's in Child Development Program? If you're considering a career in child development, you're seeking a degree that provides you with a variety of professional options upon graduation. Individuals who complete an online master's in child development choose from many different roles, ranging from teaching and counseling to overseeing a school library or developing curriculum. The Bureau of Labor Statistics projects that the economy will add nearly two million education and education-related positions in the next few years. Not necessarily. Previous work experience isn't a common requirement for online master's in child development programs, but prior education is often a prerequisite. Students with baccalaureate degrees in unrelated subjects should be prepared to take a few prerequisites before digging into the core curriculum. Before committing to any online master's in child development programs, prospective distance learners should do their research. Take time to look at many different programs, consider any concentrations offered, compare costs, and research different learning options. It's also important to speak to faculty and staff within each school to get a sense of whether or not the department can provide the support and academic success that you're seeking. CAN I WORK WHILE I COMPLETE MY ONLINE MASTER'S in CHILD DEVELOPMENT? Yes. Many online master's in child development programs offer part-time learning paths for individuals who want or need to continue working while completing their degree. Once enrolled, however, students should plan to spend between 10 to 15 hours per week completing requirements for each class taken. WHAT ARE THE ADVANTAGES TO EARNING MY MASTER'S DEGREE ONLINE? An online master's degree in child development offers all the benefits of a traditional program without requiring students to visit campus. These benefits are especially important to people juggling personal and professional responsibilities or those who don't live close to a school offering such a program. Because the school offers most of its courses asynchronously, students create their own schedules and turn in assignments at times that suit them best. UMN offers a 32-credit online master's in child development through the school's Institute of Child Development that is highly regarded for scholarship, teaching, and research. This program can be completed entirely online and prepares students to address the needs of children in a variety of community, advocacy, and healthcare settings. Students can choose from one of three tracks: infant and early childhood mental health, child life, and individualized studies. The curriculum includes coursework on a variety of topics, including child life theory, childhood death and bereavement, development and psychopathy in early childhood, prevention and intervention, and applied child and adolescent development. Applicants to this online master's degree in child development must have a bachelor's degree with a preferred minimum GPA of 3.0 to be considered. They must also have completed undergraduate coursework in psychology, human development, or social science and submit competitive GRE scores. USF offers a MS in child and adolescent behavioral health, which is a non-clinical degree program that prepares students to work with children and adolescents with behavioral challenges. The 39-credit program covers a variety of topics, including behavioral health in children and adolescents, cultural competency in children’s mental health, behavioral health policy, and research and design. Students can choose one of the following concentrations: developmental disabilities, leadership in child and adolescent behavioral health, research and evaluation, and youth and behavioral health. They also have the choice of either a thesis track or applied non-thesis track that includes a project and field experience. All students are required to take a comprehensive exam at the end of the program to graduate. Applicants must have a bachelor's degree with a minimum GPA Of 3.0; they should also submit their GRE scores and a resume outlining their professional and academic achievements. La Verne offers a 33-credit online master's in child development that integrates practical and theoretical concepts and prepares students to assume leadership roles in the field. Coursework immerses students in the study of the physical, emotional, intellectual, and social development of children. It also includes courses on education psychology, human development, methods of research, cognition and brain development, and teaching adults. This online master's degree in child development can be completed entirely online or in a hybrid format and prepares graduates to teach at community colleges in California. Applicants must have a bachelor's degree with coursework in child development, early childhood (EC) curriculum, or EC program management. They must also have a cumulative GPA of 2.75 with a 3.0 GPA in the last 60 credits of college coursework in EC courses to be considered. La Verne is accredited by the Western Association of Schools and Colleges. MSU offers a 32-credit MS in early childhood and family development through the Department of Childhood Education and Family Studies. The program emphasizes three core areas: early childhood education, child development, and family development. The curriculum includes coursework on advanced human development, early childhood and family development, education research methodology, and policy issues for early childhood settings. This online master's in childhood development offers a three- and four-semester scheduling option. There is also an accelerated option, which allows qualifying students to begin graduate-level coursework in their junior or senior year. Students must maintain a minimum GPA of 3.0 throughout the program to graduate. Applicants must have a bachelor's degree with a minimum GPA of 3.0 in their last 60 credits of coursework to be considered. Students who do not meet the minimum GPA requirements must also submit GRE scores. MSU is accredited by the Higher Learning Commission. With more than 80,000 online learners, SNHU is one of the fastest growing educational institution in the nation. The school offers a MS in psychology — child and adolescent development psychology that focuses on the real-world application of psychological research. The curriculum includes coursework on a variety of topics, such as cognitive and social psychology, learning theory, personality, and cognitive neuropsychology. Students must also complete a culminating capstone project where they demonstrate mastery of cognitive neuropsychology, developmental psychology, and intervention strategies. Graduates are prepared to pursue a variety of careers in the field, or continue their studies in a doctoral program. This program does not prepare graduates for state licensure, but it is aligned with industry standards. Applicants to this online master's degree in child development must have either a BA or BS in psychology or another related field that includes coursework in psychology, statistic, and social science. Completing an online master's in childhood development is a popular option for degree seekers throughout the country, and for good reason: these types of programs translate well to a distance learning format and make it easy for learners to attend school while working. Programs vary by school, but the following section provides students with a good idea of what to expect. Graduation requirements differ from program to program, but the classes listed below are common across master's degrees in child development. Social & Historical Perspectives of Early Childhood/Education: In this course, students look back at the numerous circumstances and perspectives in place across the historical spectrum of childhood development theory. The course places special emphasis on mainstream cultural ideas during these periods, as well as beliefs, values, and social purposes. Cognition, Language, and Play: This course familiarizes distance learners with the basic knowledge they need to understand how cognitive functions develop in children, particularly children up to eight years old. Enrolled students review prominent theoretical frameworks, social contexts, and how language and play fit in. Physical Growth and Development: Understanding how children grow and develop while in utero and through to eight years of age is the focus of this course. Degree seekers learn how to research typical development paths while studying how nutrition, growth, wellness, and general health welfare impact growth and development. HOW LONG DOES IT TAKE TO GET AN ONLINE MASTER'S IN CHILD DEVELOPMENT? The time it takes to complete an online master's degree in child development is affected by a number of factors. Programs may require individuals who hold undergraduate degrees in unrelated subjects to take a number of prerequisite classes, while those with degrees related to education can begin core coursework upon enrollment. Programmatic characteristics may also influence how long it takes. Individual pace programs allow students to move through coursework according to their needs, while cohort programs place students in a group with their peers. This group completes each class together. The majority of online master's in childhood development require that students complete between 30 and 38 credits, meaning students taking courses on a full-time basis can graduate in two years whereas those studying on a part-time basis will need three years between matriculation and graduation. Teaching License: Although each state has different requirements for obtaining licensure, every state requires that teachers earn certification before entering the classroom. Students interested in pursuing this path should check with their state's Department of Education before proceeding. Child Development Associate: Provided by the Council for Professional Recognition, the CDA helps individuals advance their careers, show a commitment to lifelong learning, and developed nuanced understandings of developmentally-appropriate practice. Nearly 400,000 educators carry a CDA credential. Institutional: Schools earn regional and national accreditation based on their ability to meet school-wide requirements. Employers, schools, and other institutions consider regional accreditation to be the most prestigious and difficult to attain of the two. Regional accreditation-awarding agencies require institutions to go through a multi-year certification process. National accreditation, conversely, is considered to be a less rigorous process and is therefore less respected. Students who graduate from nationally accredited institutions may face problems transferring credits and earning certification. Programmatic: Overseen by accrediting agencies focused singularly on those topics, this type of accreditation is earned by individual degree programs or departments. Within child development, the two accrediting bodies to look for are the National Association for the Education of Young Children and the Council for the Accreditation of Educator Preparation. Accreditation agencies must also live up to a set of standards: the Department of Education (ED) and the Council for Higher Education Accreditation (CHEA) are governing bodies that ensure these agencies are functioning properly and maintaining appropriate requirements. Accrediting agencies must provide reports of their work to the ED and CHEA to maintain their status. To learn more about accredited schools throughout the country, students can review the regularly updated list provided at the ED's website. While an associate or bachelor's degree in child development can help graduates become competitive for entry-level roles, salaries and growth potential are much higher for individuals who complete a master's degree in the field. The following table highlights common careers for child development professionals with different degree levels, and demonstrates the financial benefits that come with completing an online master's in child development. Depending on the long-term goals of professionals in this field, salaries can be very competitive. Individuals pursuing leadership or managerial roles can top out with a six-figure salary, while those just starting out typically earn close to the national average for all professional roles. The table below provides insight from Payscale regarding earning potential throughout the lifespan of each career. Working with other school leadership, institutions charge instructional coordinators with creating and overseeing school curriculum. These professionals develop materials that are appropriate for different ages and stages of cognitive development, oversee its implementation, and ensure that instructors meet teaching and learning standards. This position requires a master's degree. Librarians at primary and secondary schools ensure students have access to reading and media materials appropriate for their age and developmental levels. They also work with teachers to bring in materials that tie into content being taught while helping students use those materials in their assignments. This position requires a master's degree. This position, which requires a master's degree, focuses on working with individual students to ensure success. Whether helping learners develop academic or social skills, working with them to decide on a career path, or even providing a listening ear about difficulties at home, school counselors are on the frontline of serving students. Although special education teaching roles require only a bachelor's degree, individuals who pursue a master's degree are well placed to move into supervisory roles. When they're in the classroom, SPED teachers work with students who have any number of physical, emotional, mental, or learning issues to develop appropriate lesson plans and help them succeed. After completing a master's degree, individuals with aspirations to lead a school are qualified and prepared. Once in the role, principals oversee school functions, manage school staff, make curriculum decisions, and ensure that every student has a safe and worthwhile learning environment. Working in the field of child development affords individuals the opportunity to interact with countless others who hold similar positions, but the fast-paced natures of their days can often make these professionals feel like they're working in a vortex. Professional organizations help child development workers connect with others, learn about new research in the field, and continue building their knowledge base. NACD provides professionals with a toolbox of more than 3,000 methodologies and teaching techniques, ensuring child development professionals benefit from access to the latest research and findings. PACE exists to advance the profession of childhood education while also providing research results, annual conferences, and other services to busy child development professionals. NAEYC maintains an active roster of publications, hosts conferences and events, and provides professional development opportunities to its members. Like any other form of advanced education, online master's in child development programs aren't cheap. Students who may otherwise choose this path are often discouraged by the cost, but they don't have to be. The Free Application for Federal Student Aid (FAFSA) can help prospective students gain federal scholarships, loans, grants, or work-study funds to help offset costs. Private organizations and foundations also exist and provide myriad scholarships and grants. Schools frequently offer departmental funds in the form of scholarships or teaching assistant roles.